A United States burial casket flag drapes the casket of deceased veterans to honor the memory of their service to the country. 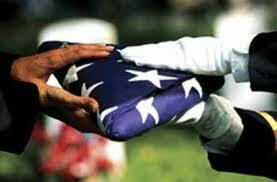 The ceremonial folding and presentation of the flag is a moving tribute of lasting importance to the veteran's family. The flag is placed on a closed casket so the union blue field is at the head and over the left shoulder of the deceased. After Taps is played, the flag is carefully folded into the symbolic tri-cornered shape. A properly proportioned flag will fold 13 times on the triangles, representing the 13 original colonies. The folded flag is emblematic of the tri-cornered hat worn by the Patriots of the American Revolution. When folded, no red or white stripe is to be evident, leaving only the blue field with stars. It is then presented as a keepsake to the next of kin or an appropriate family member. Stand facing the flag recipient and hold the folded flag waist high with the straight edge facing the recipient. Lean toward the flag recipient and solemnly present the flag to the recipient. The United States Coast Guard is invited to use the same verbiage.